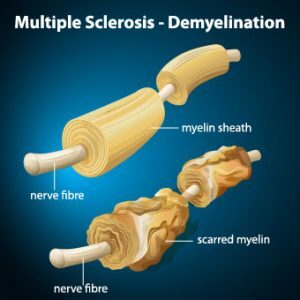 Sun exposure is crucial to preventing multiple sclerosis (MS), the terrible, debilitating autoimmune disease in which T-cells initiate an inflammatory response against myelin, the protective cover of nerves., This leaves the nerves bare and susceptible to “short circuiting,” a process known as demyelination. This attack prevents proper functioning within the brain and body, which leads to a variety of symptoms like vision changes, muscle spasms, and numbness. These symptoms profoundly decrease the ability to function and destroy the quality of life. I ran across an interesting study demonstrating that the age at which the low sun exposure occurs is also a predictive factor in the risk of MS. It showed that in Norway, the amount of sun exposure in the period of life between 16-18 years of age was critical in predicting the disease. 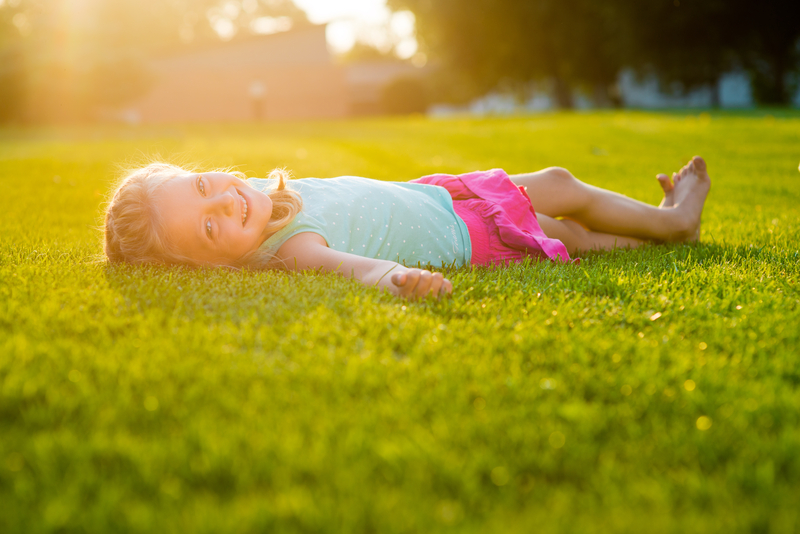 Those youngsters who experienced the lowest sun exposure during those ages were 83% more likely to develop MS. The same research showed that in Italy the critical period was between birth and age 5 years, with those receiving the lowest sun exposure being 56% more likely to develop MS. 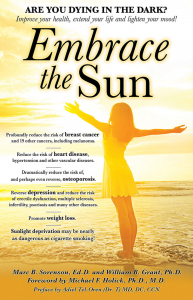 I spite of incontrovertible research that proves regular, non-burning sun exposure is critical for human health, the sunscare movement continues to promote the idea that we should avoid the sun. The blood is on their hands. Alter M, Yamoor M, Harshe M. Multiple sclerosis and nutrition. Arch Neuroll974;31:267-72. Kurtkze, J. Geography in multiple sclerosis. J Neurol1977;215:1-26. Bjørnevik K, Riise T, Casetta I, Drulovic J, Granieri E. et al. Sun exposure and multiple sclerosis risk in Norway and Italy: The EnvIMS study. Mult Scler. 2014 Jul;20(8):1042-9. 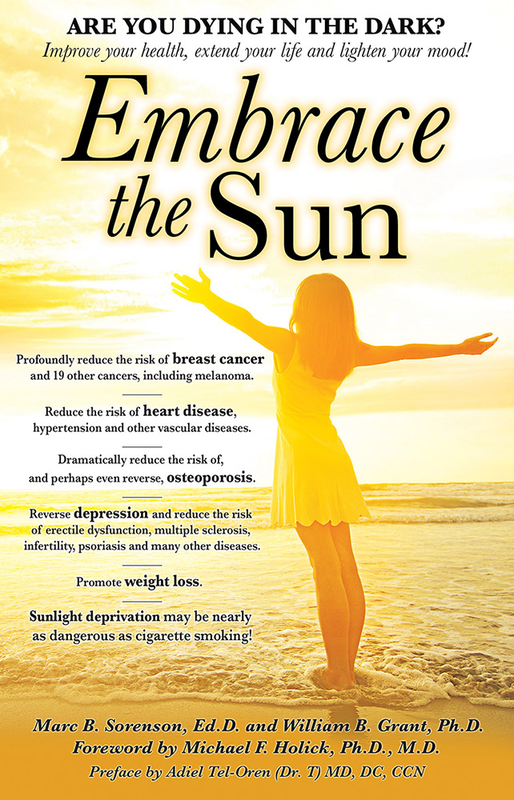 By Marc Sorenson, EdD, for sun exposure. Be sure that you soak up your share of sunlight, without burning of course. It may indeed save your life! Zivadinov R, Treu CN, Weinstock-Guttman B, Turner C, Bergsland N, O’Connor K, Dwyer MG, Carl E, Ramasamy DP, Qu J, Ramanathan M. Interdependence and contributions of sun exposure and vitamin D to MRI measures in multiple sclerosis. J Neurol Neurosurg Psychiatry. 2013 Oct;84(10):1075-81.
released from the skin following exposure to ultraviolet radiation, may have protective and ameliorating affects against MS. This research is important because it shows that sunlight exposure works on MS in several different ways, one of which may be the stimulation of vitamin D production. I have posted other blogs regarding sunlight and MS, indicative that sunlight has protective effects against that malady, beyond its ability to stimulate vitamin D production in the skin. This research by Lucas and her colleagues is important in that it defines some of the other mechanisms of sunlight exposure that could lead to the prevention and potential cure of the disease. [i] Robyn M Lucas, Scott N Byrne, Jorge Correale, Susanne Ilschner & Prue H Hart. Ultraviolet radiation, vitamin D and multiple sclerosis. Neurodegener. Dis. Manag 2015 (epub ahead of print). More Research on Multiple Sclerosis (MS): Highest Sunlight Exposure as a Teenager predicts later Age of Onset of MS. Although several of my posts on the Sunlight Institute have discussed sunlight and MS, this post will provide the results of the most recent paper that I am aware of, and it reviews some of the most important investigations showing that sunlight exposure is absolutely essential for preventing or mitigating the disease. MS is a disease in which the myelin sheaths (nerve coverings and insulators) are destroyed, leaving nerves bare and susceptible to “short circuiting.” This process is known as demyelination. 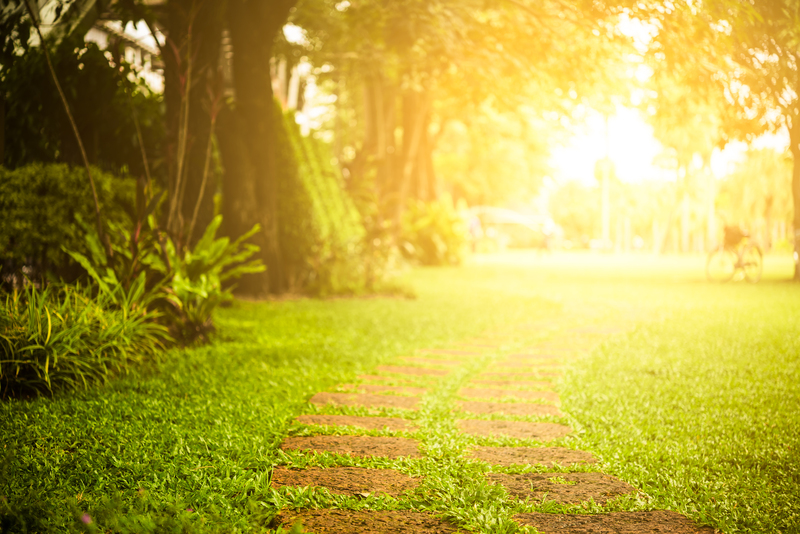 New research, which should surprise no one, demonstrates that teenagers who have the greatest exposure to sunlight have a delayed onset of MS as adults. The study involved 1,161 Danish patients with MS who were given questionnaires regarding their sun-exposure habits and body-mass index (BMI) as teenagers. BMI is a measure of obesity (or the lack thereof). Besides sunlight, other vitamin-D predicting measures were also used to determine the probable cause of MS.
Interestingly, only sunlight exposure and lower BMI were associated with later age at the onset of the disease; other serum vitamin D predictors such as fish consumption did not show any association with MS. The authors still seemed to feel that vitamin D was the reason for the extended time before disease onset; however, that is unlikely, since other predictors of higher vitamin D levels showed no association. And, it has been shown that sunlight exposure has profoundly protective effects against MS, independently of vitamin D. Researchers determined to find the mechanism by which sunlight exposure suppressed the disease and found that UV light selectively inhibits spinal cord inflammation and demyelination. In that study, they performed an investigation in which ultraviolet radiation (UVR)—the same radiation that is found in sunlight and tanning beds—was administered to animals who suffered from experimental autoimmune encephalomyelitis (EAE). EAE is MS that has been deliberately induced in animals in a laboratory setting. The researchers found that the UVR treatments stopped inflammation and demyelination of the spinal cord by inhibiting a chemical known as a chemokine, also known as a cytokine. Chemokines are the cause of the inflammation and autoimmune attacks that result in MS. The MS-ameliorating effects in the study were directly initiated by UVR, independent of vitamin D.
Stunningly, another study by some of these same investigators determined that vitamin D was actually necessary for EAE to take place! Mice that lacked the vitamin D receptor, which causes vitamin D deficiency, had a markedly lower risk of developing EAE. In those mice that had receptors but were simply vitamin D deficient, the development of EAE was also partially suppressed. I do not look on this research as proving that vitamin D sufficiency leads to MS, but it certainly indicates that sunlight exposure, independent of vitamin D, is absolutely critical to prevent and ameliorate this frightening disease. The bottom line? Be sure to get plenty of non-burning sun exposure! Julie Hejgaard Laursen, MD, PhD, Helle Bach Søndergaard, MSc, PhD, Per Soelberg Sørensen, MD, DMSc, Finn Sellebjerg, MD, PhD and Annette Bang Oturai, MD, PhD. Association between age at onset of multiple sclerosis and vitamin D level–related factors. Neurology 2015, Published online before print October 7, 2015. Wang Y, Marling SJ, Beaver EF, Severson KS, Deluca HF. UV light selectively inhibits spinal cord inflammation and demyelination in experimental autoimmune encephalomyelitis. Arch Biochem Biophys. 2015 Feb 1;567:75-82. Wang Y, Marling SJ, Zhu JG, Severson KS, DeLuca HF. Development of experimental autoimmune encephalomyelitis (EAE) in mice requires vitamin D and the vitamin D receptor. Proc Natl Acad Sci U S A. 2012 May 29;109(22):8501-4.